1 What is a Post Hole Digger? The best post hole digger, you say? Why would you ever need that? Well, let me give you some reasons. You’re about to install the deck of your dreams, but you just realized that to do it, you need to have 6″ wide by 30″ deep holes that can accommodate your deck posts as well as the concrete footing around them. Maybe you’re preparing to put up that birdhouse that your cousin got you for your birthday, and want to be sure that it has a sturdy pole that won’t shift, so you’d like to bury the post about 18″ deep. Or you’re planting a new oak tree for fall color in your back yard, and need to clear a nice deep hole that can accommodate the large root base of your three-year-old sapling. Whatever the reason, if you have a deep hole to dig, you need a post hole digger. But what’s the best post hole digger, and is there a good reason to use that instead of just digging a much larger hole with a shovel? Let’s explore the topic in detail and find the right tool for your needs. In its simplest form, a post hole digger is a device used to dig or bore out a deep hole suitable for placing a post in the ground. However, these handy devices can be used for more than just a post. They’re surprisingly effective at removing dirt from somewhat hardened soil for planting or amending, and can be used to create larger-sized holes as well as single post holes. They can also be used to help start trenches for doing irrigation, or other similar deep digging tasks. There’s two essential styles: post hole diggers that bore out a hole, and those which scoop out a hole. Either way you choose to go, it’s a great way to move soil for your current project. But why would you need a post hole digger if you have a shovel? This has a lot to do with the size of the hole you make. A standard shovel head is going to make a much larger hole than you might need, and that means that the soil around your post is going to be softer from being moved. While that won’t make a lot of difference if you have loamy, soft soil to begin with, for those who have hard-packed clay soils it certainly does. If your soil is very solid, or has a lot of rocks, a post hole digger is an essential tool to have. Whether you’re willing to use brute force or would prefer a little mechanical aid, there’s an option that will work for you! These manual diggers are a scooping mechanism which requires a little muscle. They’re great for light to medium-level digging. If you’re looking to plant a small bush or tree, are extending your irrigation trenches, or are building a fence, these should work well for your needs. Manual post hole diggers are essentially a pair of curved blades on the end of two long handles. To use them, you push them down into the soil. The curved blades will cut down into the soil. You can then pull the handles outward and lift to take a deep bite out of the ground, lifting the soil out of the way. If you’ve got a larger hole that you need to bore out, or rocky soil, you might consider a gas post hole digger. These are essentially handheld augers that bore out a round hole. They will easily cut into even the hardest-packed clay. Drilling out the post holes for your fifty-foot fence will be a breeze with one of these. In addition, a gas model is the best post hole digger for rocky soil, as it typically has enough power to move the rocks out of the way. Typically constructed of steel, there are variable blade widths available. The wider the blade, the wider the hole you can bore. Most of the commercially-available gas augers do not bore much deeper than three feet, but that’s plenty for most yard work. Electric models are quite similar to gas models, just without the smelly gas fumes. These are great if you are within easy range of a power source, and tend to run significantly quieter than their gas counterparts. However, if you are installing new fencing on the outer reaches of your multiple-acre property, you may find it more difficult to get power to where you’re at. Electric post hole diggers also have a selection of augers available, with variable blade widths and similar options to gas models. However, weight-wise they’re about the same as a gas model. Let’s go over some features you’ll need to know about when you’re in the market for the best post hole digger. While a manual post hole digger is a fairly basic piece of equipment, there’s a few things to look for. The handles of your post hole digger are the most important thing to consider. While older diggers had wooden handles, those can get weaker with age and break down. Most quality diggers are available with fiberglass handles that are reinforced for added strength. This is critical if you’re going to be going through tougher or rockier soil, as the handles are what provides the leverage needed to dig. Some handles have a modification to their ends which allows you to bring them together closely without your knuckles bashing together. Others are straight. Either option works, but be sure they’re sturdy enough to handle the task. Another consideration is the length of the handle. That length determines how easily you’ll be able to get leverage on your post hole digger. Longer is better for two reasons. The first is that a longer handle gives you more leverage in general. The second is that the longer the handle, the deeper your hole can be. Both are important factors. I find a 60″ handle is usually about perfect for me. The other aspect of the post hole digger that you should be attentive to is the joint where the two scoop-shaped blades join together. Be sure it’s a strong joint, preferably one which won’t loosen easily. While the blades are generally constructed sturdily, they’re useless without a secure swivel point. Without a decent motor, your gas post hole digger isn’t going to do what you want it to do. The better options are 2 to 2.5 horsepower motors which have enough power to get the task done. If the digger that you’re looking at is a lower-powered motor, I do not recommend it. The auger, or the bladed bit that attaches to the motor, needs to be constructed of high-carbon steel. Anything else may be a liability, as it could snap and cause damage to you or your post hole digger if it hits something solid. 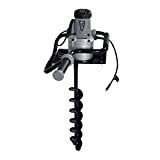 Most gas-powered post hole diggers have interchangable augers available in sizes from 2″ through 10-12″ diameter, depending on the size of hole you need to dig. There should be extremely sturdy handles on your post hole digger. After all, you’re going to need to hold on tightly to them to control it. If you’ll be working for a long period of time or doing multiple holes, you may want to consider handles with anti-vibration padding. These help reduce the level of vibration that shakes the arms and upper torso, thereby allowing you to work longer. The weight of your automatic post hole digger is also something to take into consideration. Most units are lightweight enough that one person can use them. However, in more difficult soil conditions or uneven terrain, you may need a second person to help control your digger. The majority of electric post hole diggers have a 1200W motor. Anything less than that strength just won’t be effective. I have yet to find a cordless electric post hole digger that works well. The models I would recommend all have power cords attached, usually short. Be sure you have an extension cord which can handle the power needs of your digger, as well as a nearby power source. Anything far away from a power source will likely require a manual or gas post hole digger. Otherwise, you want to take into consideration the same aspects as with gas post hole diggers. You are going to want high-carbon steel augers, particularly on a device that has interchangeable augers. You need sturdy handles, and may want to consider anti-vibration padding. And weight is still something to be aware of. Before you start to dig, you need to be prepared. Heavy clay soils or rocky soils should have been given a good soaking over the prior few days to allow the soil time to soften up a bit. You want to wait at least a few hours after the last soaking so you’re not drilling into mud. You want foot and leg protection, even with a manual model. I know, this should go without saying, but you need to be wearing heavy shoes and long pants. For a manual, this is mostly to protect your feet and legs from the edge of the steel blades. With a gas or electric model, this also protects your feet and legs from flying dirt and rocks. Eye protection is also a good choice, just in case any rock shards start to fly. If you’re working on an uneven surface, like the side of a hill, you want a second person to assist. If you’re off-balance, your hole may not be straight down, and it may be harder to control the machine. A manual post hole digger can be easily adjusted. A vibrating, heavier machine is trickier. For gas types, be sure that the fuel tank is filled with fresh fuel and that the carburetor isn’t gunked up from a long period of storage. Make sure it’s functioning in advance of digging day! If you want a manual post hole digger, the Seymour post hole digger is your best bet. Built with layered fiberglass handles wrapped around a solid inner core, these are meant to last. The steel blades easily cut through roots and hard soil. Padded grips top the handles, ensuring that you’ll always have a secure grasp on your tool. 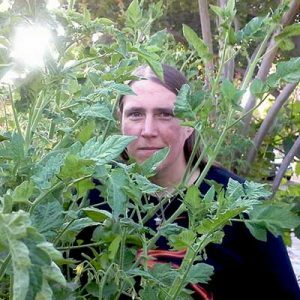 It cuts out and lifts out neat, round bites from the soil. This may require some muscle to use, but for manual options, this is really the best post hole digger and a solid tool to keep around. 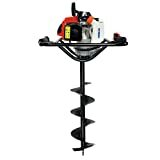 If you’re looking for the best post hole auger in the gas category, look no further. The Earthquake has a very solid 250 RPM two-stroke motor that can easily handle turning the auger bit through any soil type. In addition, it’s got a very wide variety of auger bits and even depth extenders available, as well as replacement tips. The handles are designed to be anti-fatigue handles, reducing the vibration levels significantly. 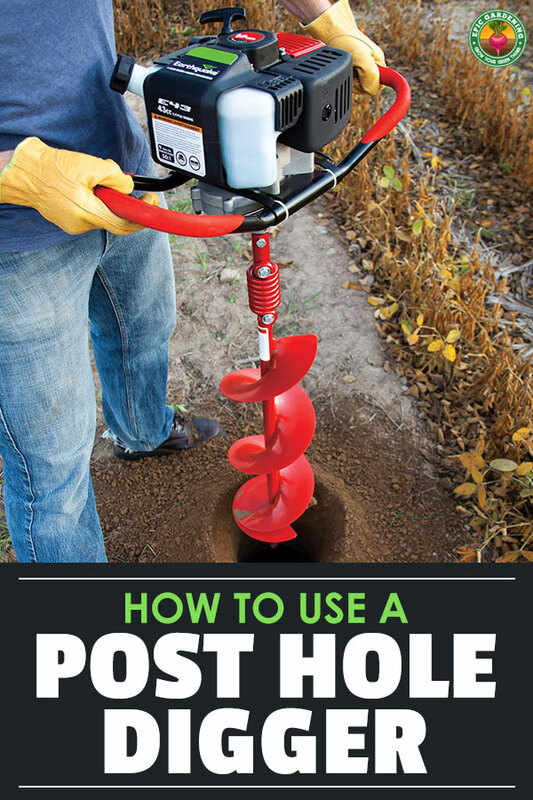 All in all, if you want to easily clear that space for your new tree or for your deck post, this is going to do it quickly, easily, and with a minimum of fuss with this choice for the gas best post hole digger. The best post hole digger in the electric category goes to the Goplus. While it comes with only a single bit, other auger bits are available for this model. It neatly slices perfect holes into the ground, and can chew through tree roots or rocky soil without a problem. This one might not work if you’re going ice fishing and are looking for the best post hole digger to take in the middle of nowhere. Its limitation is the requirement for power. However, for pretty much any normal situation, this is the perfect electric option, and you don’t have to fuss with a gas can or draining the tank when you’re going to store it away. Let’s say you have a small project, and a small budget to accompany the project. You don’t have to go without a post hole digger, though. The Bully post hole digger features triple-reinforced fiberglass handles paired up with a set of 12-gauge steel blades. For the average homeowner, this is plenty to get needed repair work done or to put up that birdhouse or free lending library in the front yard. As with all manual post hole diggers, some strength is required to use it. 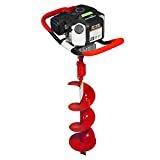 All things considered, this is a sturdy tool that will dig all the holes you need it for in the average residential setting, and for the price, this is the budget-friendly best post hole digger choice. This post hole digger is also a great model. While I don’t consider it the best post hole digger in the gas category, it’s worth checking out if you want to save a few dollars. The Earthquake has a much wider variety of auger bits available, and that variability in purpose gives it the clear edge over this one. Despite that, this model is also quite good, and is an excellent choice if the Earthquake isn’t available to you. And, let’s face it, you’re just boring holes in the ground. If you’re doing standard fence installation only, this is all you’ll need. The Goplus has the distinct advantages on price and bit availability. But I have to give the Hiltex post hole digger some credit as well. It has a reasonable auger bit selection, but what strikes me the most is the variety of lengths that they offer as well as widths. With lengths of 6″, 8″, and so on, you can drill precisely to your intended depth with no guesswork. While it’s not the best post hole digger in the electric category, it’s a firm contender, and is well worth the money. Now that you’ve seen the options, what’s best for you – manual, gas, or electric? I know that for me personally, I’d like both a manual and a gas option, although there’s appeal in the lack of fumes and maintenance requirements with electrics, too. Maybe I just need one of each, just to be sure… So what’s your pick? Tell me in the comments! I have a Ford 8n tractor with a Danuser 3pt PTO post hole digger where by I will be augering through shale with a 9″ auger but I didn’t see anywhere you described what auger tips/points are best to use in different situations. I’ll update this article with some auger tips / points in the near future, Dave!